A Walton in GTA Vice City. "Redneck, trailer trash wagon. Marry your sister-types. Swamp trash and the like." The Walton is an old pickup truck available in Grand Theft Auto: Vice City, Grand Theft Auto: San Andreas and Grand Theft Auto: Vice City Stories. Throughout its appearances, the Walton resembles a 1955 2nd series to a 1959 Chevrolet (or GMC) truck with the front of a 1954 or 1st series 1955 Chevrolet truck. It also features a small stake bed, which provides a decent sized flat surface area, making it a suitable sniper platform if no Journeys are available. In GTA San Andreas, the Walton may optionally spawn with a load in the back, such as wood pallets or propane tanks (which do not explode when shot). When the tailgate is opened, none of the items in the back will fall out, even when driving off road or if the player crashes. There is also a junked Walton in front of Catalina's shack in Fern Ridge, Red County, San Andreas. A rusty/wrecked Walton outside Catalina's home in Fern Ridge in GTA San Andreas. The Walton's road-going capabilities are, as expected, underwhelming. For GTA Vice City and GTA Vice City Stories, the Walton is only given slightly below-average acceleration and speed, as well as sluggish controls, owing to its age, weight, and size. The Walton's engine power is even worse in GTA San Andreas, where it is revealed the truck often struggles up steep inclines. In both GTA Vice City and GTA San Andreas, the color white is not normally available on any Walton, except during missions and when the player modifies the carcols.dat file to make Waltons spawn in white. 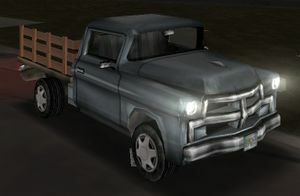 In GTA Vice City, four white Waltons will appear during "Gun Runner" as transport vehicles for a gang of gun runners which the player must eliminate. While the player can in fact the kill the driver of any of the Waltons with a sniper rifle and commandeer one, the player must destroy all the Waltons as well to complete the mission. A workaround to this is simple; the player will simply need to collect all of the weapons, then place the last working Walton in a garage and destroy it (thereby passing the mission). After the garage door is closed, the wrecked Walton will reappear in working order when the garage is reopened. For GTA San Andreas, a white Walton is a crucial piece of equipment during "Madd Dogg", when the player must save a drunken Madd Dogg from falling to his death by taking the truck parked nearby and aligning the truck's box-filled bed with Madd Dogg as he is about to jump from a ledge. Once Madd Dogg lands on the bed, the player must then drive him to a rehabilitation clinic, completing the mission. The player may then store the truck in a garage. Alternately, the player can also fail the mission by opting not to save Madd Dogg and still acquire the truck nevertheless. The truck is also bulletproof. A white Walton in GTA Vice City, found during "Gun Runner". A white Walton in GTA San Andreas (complete with torn boxes in the bed), acquired from "Madd Dogg". When entered in GTA San Andreas, the Walton plays K-Rose by default. The name of the truck may have been inspired by the television series "The Waltons". The description for the Walton in the BradyGames Official Strategy Guide is "Goodnight, John Boy. Goodnight, Mary Ellen..."
Spawns randomly in Viceport, although it may spawn in the construction area in Vice Point. Beside the wooden bridge that connects the dirt road that connects Back o' Beyond and Whetstone. Among some trees at the intersection of 3 dirt roads in Back o' Beyond. Behind the Angel Pine Sawmill. In Leafy Hollow (The Truth's farm) in Flint County. Around the Flint County Safehouse. On the outskirts of Fort Carson in Bone County. A Walton filled with boxes in the stake bed is used in the mission Madd Dogg, in where you have to save Madd Dogg from falling to his death from the roof of the Royal Casino. This also has a special white color and is immune to bullets. Spawns randomly in the countryside areas of Red County, Flint County and Whetstone and desert area of Tierra Robada and Bone County. Near Auntie Poulet's home in Little Haiti. Sometimes many Walton are seen at Escobar International Airport. This page was last modified on 7 April 2015, at 18:16.